140,000 64 x 64 pixel phase correlations per second. Can scale to arbitrary frame size, e.g. 1024 x 1024 @ 564/sec. Daughter module interface for connection to a frame grabber. 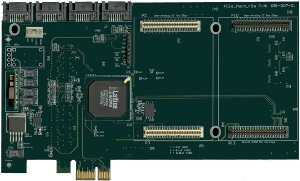 Frame grabber options: 4 channel ADS930 ADC, Camera Link, GigE Vision, or a custom image acquisition interface. Two SODIMM DDR2 memory modules, supports up to 8GB. 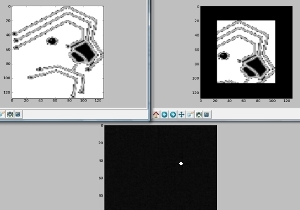 Correlate images in real-time mode or coprocessor mode. For more information about Echelon, download the Echelon product brief. For more information about phase correlation, see the web page about Touit's phase correlation IP. Touit provides both Windows and Linux support for Echelon. 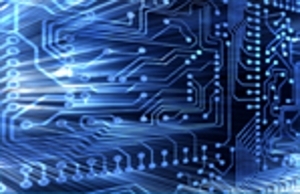 This includes the device drivers, API, a Python interface module, and sample programs. The Python interface module allows users to interact with Echelon through the Python command interpreter. Providing Echelon users with a platform or environment that can support experimentation and algorithm trade-offs. Python is the interface of choice because it is an open source interactive programming environment with a wide selection of open source libraries, particularly NumPy and SciPy for matrix and signal processing operations. Together these software tools provide an easy to use platform from which the application can quickly be tested and demonstrated. Which may ultimately become the final application.